COME TO THE MALTON BOOK FESTIVAL 20TH COTOBER 2012 Click here to view the presentation on creative writing and self-publishing which was exhibited at last year's show.
" Student life in sixties Liverpool was amusingly described – and like the descriptions of potholing – it almost made me nostalgic for the all night parties of youth. However, nowadays, I prefer a good read – which ‘The Loner’ very much was." Chris Howes (Descent Magazine) says: “The final word? This is a highly enjoyable piece of almost-escapism into a world of caving now gone with the decades; you may even recognise some of your own fears, thrills and escapades. If you were around in those years, the feeling of reliving an era will come flooding back, from student demos to college parties and of wistful references to Woodstock instead of Glastonbury. The read is worth your whiling away a few hours between trips.........................But muse over the theme of The Loner – it carries more than the obvious message”. Tom Tyson, barrister-at-law says:"............ A sharply observed, thrilling and suitably comic court scene is both authentic and entertaining - from the nerves of the accused to the brash self-confidence of the dapper barrister, culminating in the excitement of the eventual verdict............"
An amusing and exciting tale of student life at Liverpool in the Swinging Sixties. Mark is a nervous law student. He is ruled by an overwhelming, irrational fear of people – particularly girls – which shows itself in a bad stammer, and a terror of heights. Fiona is the girl of his dreams, but she is in a steady relationship with a lifelong boyfriend in Scotland. Mark realises he is never going to get anywhere in life or in love unless he undergoes a complete personality change. So begins a whole series of madcap adventures, featuring a yacht race, horse riding, underground adventures in Yorkshire and Mendip caves, dances, parties, and some wild and riotous student incidents, often involving too much alcohol and close shaves with the law. Where can I buy "The Loner "? 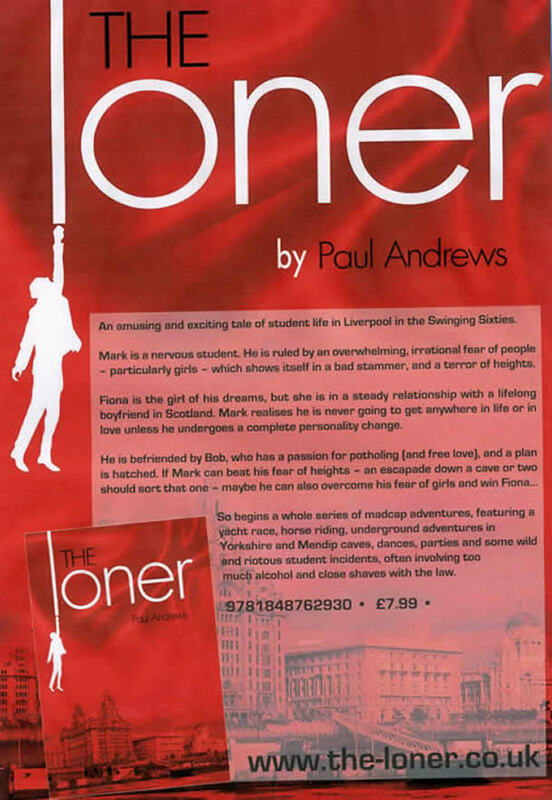 The Loner is available from all good book shops. Paul Andrews is a retired solicitor. He was a student at Liverpool during the 60s, and has always been interested in adventure sports, particularly riding, potholing and sailing. A columnist for his local newspaper, he is also interested in local politics, and is an elected district councillor. For more information, please click here and visit his community site. All rights are reserved. N o part of The Loner can be stored on a retrieval system or transmitted in any form or by any means without the permission in writing of the publisher.